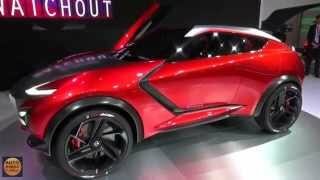 At the Frankfurt Motor Show 2015, automaker Nissan promised the world to bring a jaw-dropping crossover concept and here they are with Nissan Gripz Concept 2016, fulfilling their promise. Featuring a sports car image with raised ride height, the concept commendably won all the accolades. 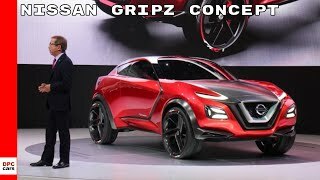 Let us have a look at the descriptive review of Nissan Gripz Concept 2016 to know better about it. 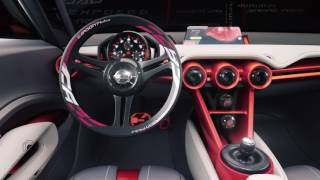 The interior of Nissan Gripz Concept 2016 is undoubtedly a peep in the future of automotive industry. The major sight of attraction comes through exposed tubes and bucket seats in 2+2 configuration. The set up to lot of extent might remind you traditional bicycles. The glory continues further and spreads over to steering wheel that features the graphics same as that you’ll notice in the sidewall of tires and the door pulls. Moving ahead in the cabin area, you’ll notice a chronograph-inspired instrument cluster design and I must say that the set up is indeed one of its kinds. Carrying the trend is floating digital display mounted amidst the dual-layered dash. However in between these distinctly designed elements you might find the center console a bit ugly. 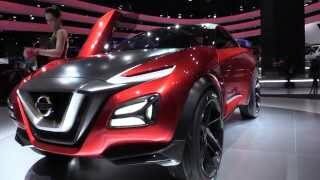 Talking about the exterior of Nissan Gripz Concept 2016 I have an entire list of appreciation which might convert the review into another novel. Starting with the front fascia, model comes mounted with boomerang-like headlights sitting over the tight matte black hood on both the corners. Between these aggressive eyes is a V-motion grille which is the trademark of the company. Accommodating both the sides of the grille are high and low beam rectangular lamps which also feature forward-facing cameras. Moving towards the rear you have a truncated matte black kamm tail marking its presence and glorifying the high trunkline and giving the entire set up an off-road aggressively sportive touch. In all this is what exactly the exterior of Nissan Gripz Concept 2016 is about, aggressive, sportive, innovative yet classy and elegant. Till date Nissan didn’t share any details about the performance of Nissan Gripz Concept 2016 but we assure to present them to you, as soon as we get them from the officials.